Galerie Der Sturm [Herwarth Walden], Berlin. H.K. Roethel & J.K. Benjamin, Kandinsky, Catalogue Raisonné of the Oil Paintings, vol. I, 1900-1915, London, 1982, no. 145 (illustrated p. 157). Berlin, Galerie Der Sturm, Kandinsky-Kollectiv-Ausstellung, 1912, no. 32 (in the second edition of the catalogue, incorrectly dated 1910, p. 29). Copenhagen, Galerie Kleis, Der Blaue Reiter, 1914. Copenhagen, Statens Museum for Kunst, 1957, no. 5. Abandoning a promising legal career in Moscow at the age of 30, Kandinsky travelled to Munich to study painting. From 1903 and for the next five years he travelled widely throughout Russia, North Africa and Europe, arriving in Rapallo on Italy's North West coast in December 1905 and staying until April 1906. This stay heralded a shift in Kandinsky's aesthetic as he explored the pictorial possibilities of the landscape around him. Working primarily in oil and often in small format, Kandinsky worked to capture the atmosphere and ambience of the port and seascapes he saw from the harbour. 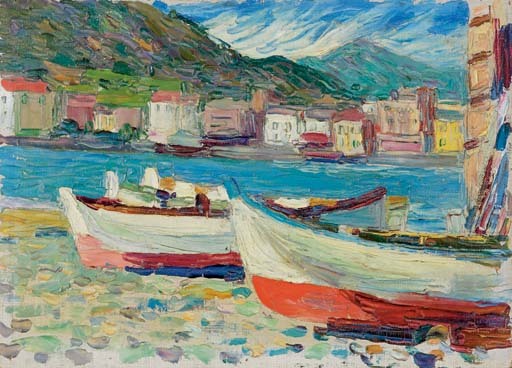 Kandinsky's use of the palette knife to apply his paint in thickly worked and textured strokes lends paintings such as Rapallo, Boote a rich, expressive quality that in its immediacy and simplicity anticipates the artist's move towards abstraction.